The 25th shout out goes to Adam Dikko. For most of us who were born after the defining military regimes of Major-General Mohammadu Buhari and Major-General Ibrahim Babangida, it could be a little sketchy separating facts from fiction, as everybody seems to be biased in their analysis of both regimes. So, we take what we can and try to imagine what it must have been like. Time and time again however, we fail. Simply because we cannot imagine that which we have no concrete idea of… And so, we yearn to have a truthful, unbiased, creditable account of what our joint history must have looked like. Well, we would have to look further, but, Soldiers of Fortune is a good place to start. You can not fully understand the simplicity that draws one to this book, until you have done it justice by reading it. There is no grandiose attempt to sound overly scholastic. It is an easy read, gets its points across without being unnecessarily verbose. With research and facts from about 125 publications covering books, articles and legislation (yes, I counted), I dare say Mazi Max Siollun was very thorough with his research. He presents facts from different sources, and walks you like a friend, to a logical conclusion of the gray areas in Nigeria’s government from 1983 – 1993. There are little facts in the book however, that would make one realise on reading, that oral literature also plays a huge role in getting acquainted with history, and Mr Siollun does not overlook this aspect at all. How else would he have known that Maryam Babangida held her 6 month old daughter in her hands while IBB’s living quarters was attacked in 1990? How else would he have known that we had a Mary Antoinette-esque “leader” in Dikko back in the days? These little seemingly unimportant facts helps one understand the quality of work one has on a platter. This book simply exposes the nitty-gritty of the workings of governance in the time it covered, analyses these critically, fairly points out the failures and successes of those regimes and most importantly, piques your interest in Nigerian history. It just leaves in you a desire to start by reading all the books in the bibliography, to be very honest. Are you interested in the History of Nigeria? This is a good place to start right. Are you reading for pleasure? This is a good piece for your reading pleasure. Are you a curious mind? Just reading to gain some understanding? You definitely can’t go wrong with SOF. The book comes packaged in a lovely shade of golden-yellow containing 3 newspaper clips of Babangida, Buhari and Abiola as its front cover. Its writing is very catchy as well, and its extensive use of dates cannot be faulted. It treats its topics profoundly and has very cohesive maps of the country. It comes with some picture spreads of the key players of the polity at the time, which is a very thoughtful addition (I must say). In spite of the simple, factual approach to this work nonetheless, not all truths are pleasant, and one is bound to realise this. There was obviously no other way to paint some of the pictures this book presented on a lighter note. I found a few truths rather depressing but educational. This is what the book offers. No beautified, white-washed facts. What the country saw in those years is what you get. Really. Sadly, being a very critical reader/eye myself, I discovered that the 336 paged book has a single editorial mistake which could easily have been overlooked (but I can’t) on page 150. I do hope future editions correct this dot of imperfection on an otherwise perfectly, deeply satisfying read. Finally, if the aim of Soldiers of Fortune by Max Siollun was to fill the void that our renewed interest in history has created as it postulates, then I must say this is a very good job, and I look forward to reading more works from this author. 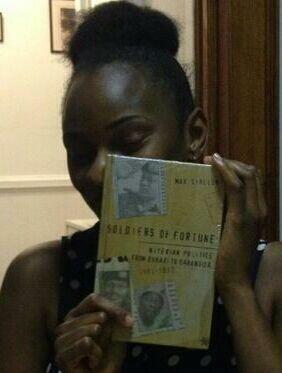 Soldiers of Fortune is the second major work by Max Siollun on the political history of the Nigerian military. It is a logical sequel to his first remarkable book of four years ago titled Oil, Politics and Violence (1966-76). 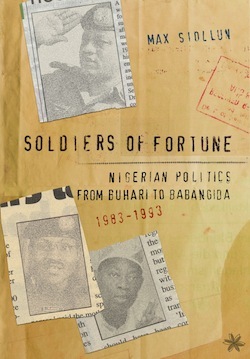 The subtitle of Soldiers of Fortune is Nigerian Politics from Buhari to Babangida, which gives a clue to his major preoccupation: the forcible taking of power by the military and how they preserve it. Siollun takes the story on to the second period of military rule, which began with the coup of December 31 1983 and concluded with the departure from power of President Babangida on August 27, 1993. Apart from the coups of 1983 and 1985 and the failed Orkar putsch of 1990, he takes in other events from this turbulent period such as the Dikko kidnap, Vatsa’s ‘plot’, the killing of Dele Giwa, the reason for Babangida’s long survival in power, the still enigmatic annulment of the June 12 election and the eventual temporary end of military rule. With a skilful inter-weaving of reporting and analysis, Siollun gets closer to understanding the inside story of Nigeria’s military rule and its graphically-described cast of personalities than other literature that I know of on the subject. It is a bold venture, of a kind that others have shied away from, and on which published literature is still patchy. In his own introduction Siollun acknowledges that little is known of Nigeria’s military and political history “due to an almost mafia-like code of silence by its leading figures.” This book Soldiers of Fortune is a serious attempt to redress the balance, although he himself recognises there is a great deal that is still speculative, and may indeed never be known. Still, his painstakingly acquired inside knowledge and scrupulous attention to detail make this book essential reading for anyone interested in trying to comprehend the complex scope of Nigerian politics both civilian and military, and answer some of its riddles. Siollun’s particular flair is in the forensic deconstruction of coups. One found this skill on show in his first book, and here the highlights are undoubtedly the panoramic mechanics of the coup of December 31 1983, and to a lesser extent that of August 27, 1985 (which was in fact a much simpler and entirely bloodless exercise). One must also commend the difficult piecing together of the Orkar coup of 1990, although this is still highly opaque, and also the way in which he traces the unravelling of Babangida’s power between June and August 1993. This was a kind of coup in reverse, and contains several different layers of fact that even now can only be dealt with by different forms of conjecture. One of the main players, General Abacha, is no longer with us, and probably would not have divulged his exact motivation in any case. Siollun’s own comments complement these aphorisms, with a number of thoughtfully turned phrases such as “the military doctor became infected by the ills it came to cure,” or “if Shagari had analysed previous coups he would have noticed that they had almost always been carried out by the same group of military officers”. The author’s investigations are illustrated by complicated lists of office-holders, essential for those trying to understand the chemistry of military action, although it is fair to say that this book does not suffer from the problem of some academic books on Nigeria, which drown in long lists of acronyms and titles. Siollun’s lists are always organised and relevant. His writing is also free from the jargon of political sociologists, which makes the book a pleasure for readers, who can pick their way through the intricate plots almost like a detective story. One is sometimes suspicious of over-embellished footnotes, but in this case researchers will also treasure his endnotes and his index, if only to look up the illuminating references to individuals in the cast of characters. There is a chapter on the Dikko affair, which marshals most of the known evidence, including some particular insights on Nigeria-Israel relations from Gordon Thomas’s secret history of Mossad called Gideon’s Spies. The Israeli involvement is clearly spelt out. There are one or two sources that Siollun has missed, and although he accurately names Elisha Cohen of the Israeli construction firm Solel Boneh, I looked without result for the identity of the mysterious Mr Big, the reputed financier of the operation who was mentioned at the 1985 Old Bailey trial (I know because I was in the courtroom when it was mentioned). There is also a long and detailed section on the circumstances around Vatsa’s ‘plot’ of late 1985. Although the extent to which it had been cooked up by Babangida to help consolidate his power does not seem to be quite proven, Vatsa’s own real involvement is still questioned, and remains a subject of controversy in Nigeria. Likewise, on the Dele Giwa affair Siollun goes very thoroughly through the known evidence, with some particular insights offered from his own sources, but the guilt of any perpetrators is implied rather than spelt out. The accounts of both the Vatsa and Giwa episodes will form an essential part of any documentation on what are still enormously sensitive subjects that are again the subjects of a certain omerta (this mafia-type silence Siollun has found). And if Babangida is the over-riding presence, the self-described ‘evil genius’, Abacha is there working away below the surface like a canker-worm, eating at Babangida’s elaborate structure of self-preservation. Siollun thus will be obliged to give us a third and final volume on the most horrendous years of military rule, from 1993-1999, in order to complete this tragic continuum. Specialists in the turbulent moments of Nigeria’s recent history will also want to turn to the chapter Siollun calls ‘The Niger Delta Coup’ which deals with the bloody but unsuccessful attempt to overthrow Babangida on April 22 1990. There are still many outstanding issues around this event, not least because the vexed agenda of excising far north Islamic states from the federation raises the famous ‘Nigerian question,’ which has so troubled those trying to analyse the country’s survival. Here again one has to admire Siollun’s ability to put together potted biographies of the leading players, such as Gideon Orkar and Great Ogboru, as well as taking due account of vital connections of peer groups. 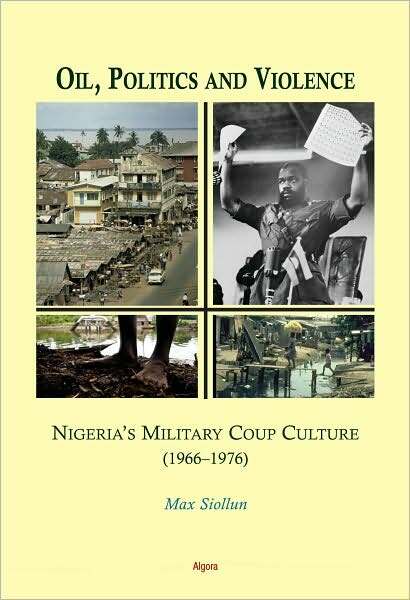 The section on the 1990 coup attempt is one of the most detailed and informative accounts existing of an event that many Nigerians would prefer to forget, although it anticipated the ‘resource struggle’ that came in after civilian rule in 1999 with the militants’ struggle in the Delta. Orkar’s broadcast after taking the radio station makes compelling, even shocking, reading. After saying it was not just another coup, the broadcast went on to describe the action as “a well-conceived and executed revolution for the marginalised, oppressed and enslaved peoples of the Middle Belt and the South”. This in fact gives the clue as to its shortcomings and why it failed. Siollun posits here the failure to eliminate the top brass (such as Abacha), the failure to neutralise communications and above all the lack of political sophistication. For this chapter alone this book has to be read, but the whole work contains much essential information in a similar vein. It is a combination of contemporary history with analysis at its best. And any future Nigerian Shakespeare would find here enough classic drama of tragedy and intrigue to provide background material for a whole sequence of plays. Soldiers of Fortune is published by Cassava Republic press in July 2013. For more information, go to http://www.fortunesoldiers.com. The Bookseller, Unity Plaza (by Biobak Restaurant), Area 11. This is a great video on Nigerian publisher Cassava Republic Press. Cassava is run by Bibi Bakare-Yusuf and her husband Jeremy Weate. They have done a lot of tremendous work in promoting Nigerian (and African) literature, and against all obstacles and odds, have made huge strides in promoting a reading culture in Nigeria. I must also give them tremendous credit for their amazing hard work and hustle in publishing my book “Soldiers of Fortune”, and continually striving to promote the book via every conceivable avenue. Both of them are stars.